Basecamp does not natively support time tracking. Roadmap's free browser extension allows you to log time from within Basecamp. 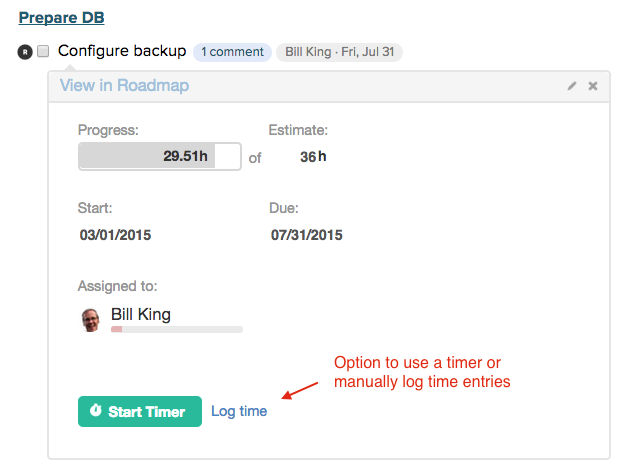 Start a timer or manually log time entries. Learn how to configure and install the browser extension . Basecamp Classic time entries are imported into Roadmap. Once in Roadmap they are read-only (i.e. for reporting purposes only). On individual projects in Roadmap, clicking the "Manage Time in Basecamp Classic" button (A) will open the Basecamp Classic project in a new browser window. All Basecamp Classic time entries are designated with the Basecamp icon (B). You have Basic subscription plan. Time tracking is only available to Plus or Pro subscription plans. Time tracking is disabled for your account. See below for how to enable (must be admin).